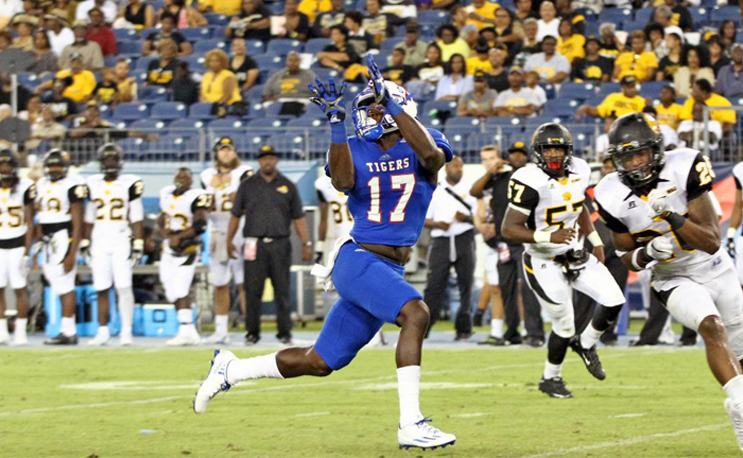 Patrick Smith is known to take it to the house for Tennessee State. With 13 touchdowns in 11 games last season, the end zone is a regular home for him. On Saturday when the Tigers play Jackson State in the Southern Heritage Classic, he will literally be at home. “It’s going to be a very exciting game especially with me being from Memphis, going back home so I can show out in front of my family. Now with my last year, I have to go out there and really show the world, show my people what I can do. Prove that I belong at the top and our team belongs at the top,” Smith said. TSU is currently riding a five game winning streak in the Southern Heritage Classic over JSU. However, Patrick Smith is more concerned with his teammates than his opponents. He has a brand new quarterback in Treon Harris and he’s still looking for that timing that only comes in real live games. Smith had a touchdown in last year’s game to tie the score at 26 in the third quarter. It was part of a comeback where TSU outscored Jackson State 21-3 in the second half to win the game. This is the 28th straight year of the Southern Heritage Classic in Memphis, these two teams have met for all but two of those years. The battle of the bands is as big of an attraction as the game itself and even more so this year. Jackson State fired their band director one week ago and this will be their first public performance since then. Jackson State comes into this year’s classic after a brutal week one at TCU, losing 63-0 to the FBS opponent. JSU has a slew of new faces on their team this year and opening with the likes of TCU was a tough first step. This game should give fans a better indication of where Tony Hughes has this year’s team headed. Tennessee State enters the game with a win to their credit and some rest. They last played on August 31st, a Thursday night win over Georgia State in Atlanta. Patrick Smith put himself on the NFL map as a junior when he had a career day vs Vanderbilt with 6 receptions and 173 yds including a career best 93 yd scoring play in a loss to the SEC school.